Richard Hague was born August 7, l947 in Steubenville, Ohio, in Appalachian Ohio’s Steel Valley where during high school and college he worked summers for Wheeling Steel and the Penn Central Railroad. He studied as a high school student at Northwestern University’s Summer High School Journalism Institute and as an adult in Oxford, England; his BS and MA degrees in English are from Xavier University in Cincinnati. He continues to teach writing to adults and young people in Cincinnati. He is former Chair of the English Department at Purcell Marian High School where the Writing Program he designed and administered won the National First Prize in the English-Speaking Union"s “Excellence in English Award” in l994. He has taught at Purcell and Purcell Marian since l969, starting up the interdisciplinary Course of the River and other elective offerings in the school’s Department of Interdisciplinary Studies, which now includes two more courses, The Tree, and The Devil, examining their subjects from religious, scientific, and literary points of view. His creative writing students have won First Place in all of the most prestigious Ohio writing contests, including the Lucille Loy Kuck Ohioana Award for Excellence in English, sponsored by the Ohio Department of Education and the Ohioana Library Association, the Ohio High School Poetry Contest sponsored by Ohio Northern University, The Raymond Walters College High School Poetry Contest, the Stan and Tom Wick Poetry Scholarship at Kent State University, and the Anne Tansey Poetry Award, as well as winning an Ohio Arts Council High School Scholarship in Poetry. His own life as a writer has been busy as well. He was the l982 Cincinnati Post-Corbett Award winner in Literary Arts. He has been a member of the staff of the Appalachian Writers Workshop in Hindman, Kentucky, most recently in 2004, The Augusta Writers Roundtable in Augusta, Kentucky, the Midwest Writers Conference at Kent State University, The Highlands Summer Conference at Radford University in Virginia and was Literary Artist for the l984 Kentucky Institute For Arts in Education at the University of Louisville. He was named a Scholar in Creative Nonfiction to the Bread Loaf Writers Conference, and a Finalist in the Associated Writing Programs Award in Creative Nonfiction. 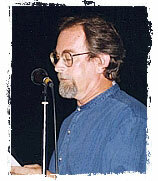 He is Editor Emeritus of Pine Mountain Sand & Gravel, an annual anthology of contemporary Appalachian writing. His poems, essays, stories and reviews have appeared in Poetry, Country Journal, Creative Nonfiction, Birmingham Poetry Review, The Heartlands Today, Asheville Poetry Review, Nimrod, Appalachian Heritage, Appalachian Journal, The Cleveland Plain Dealer, Now & Then, Negative Capability, Ohio Magazine, English Journal, The Prose Poem: An International Journal, Religion & Ethics Newsletter. Basic Education, and Teachers & Writers. as well as two dozen other magazines and reviews and in over two dozen anthologies, including A Southern Appalachian Reader (Appalachian Consortium Press), Old Wounds, New Words, (The Jesse Stuart Foundation), Learning By Heart: Contemporary American Poetry About School (University of Iowa Press, 1999) Essential Love: Poems About Mothers And Fathers, Daughters And Sons (Poetworks/Grayson Press, 2000), in Resurrecting Grace: Remembering Catholic Childhoods (Beacon Press 2001), Pass/Fail (Kleidon Press, 2002), I Have My Own Song For It: Modern Poems of Ohio (University of Akron Press, 2003) and O Taste And See: Food Poems, (Bottom Dog Press, 2004). He is a recipient of grants and fellowships from The Greater Cincinnati Foundation, The Council for Basic Education, The Southern Poverty Law Center, the Marianist Education Consortium, and three Ohio Arts Council Individual Artists Fellowships in two genres. He won the $1,000 First Prize in the year 2000s Sow’s Ear Poetry Review contest, and was, for the second time, a Finalist in the l999 Pablo Neruda Prize for Poetry, sponsored by Nimrod: International Journal. He recently completed a stint as Creativity columnist for Personal Journaling and has had work in Basic Education and Teachers & Writers, where his essay was a Finalist for the first Bechtel Prize. He has twice been recognized as a Master Teacher by the Faculty at Purcell Marian High School and was voted 2003 Teacher of the Year by the Senior Class. He has presented professionally at the National Council of Teachers of English and the Ohio Council of Teachers of English and Language Arts annual conferences. He lives in Cincinnati’s Madisonville neighborhood with his wife Pam Korte, a potter and Assistant Professor of Ceramics at The College of Mt. St. Joseph, and his two sons, Patrick, a student at Indiana University, and Brendan, a student at Purcell Marian High School. Hague, Richard. The Time It Takes Light. Cincinnati: Word Press, January 2004. Hague, Richard. Alive in Hard Country. Huron, Ohio: Bottom Dog Press, 2003. Hague, Richard. Garden. Cincinnati, Ohio: Word press, 2002. Hague, Richard. Greatest Hits: 1968-2000. Johnstown, Ohio: Pudding House Publications, 2001. Hague, Richard. Milltown Natural: Essays And Stories from A Life. Huron, Ohio: Bottom Dog Press, 1997. Hague, Richard. A Bestiary. Johnstown, Ohio: Pudding House Publications, 1996. Hague, Richard. Mill and Smoke Marrow, in A Red Shadow of Steel Mills. Huron, Ohio: Bottom Dog Press, 1991. Hague, Richard. A Week of Nights Down River. Cincinnati, Ohio: Jim Quinlivan & Gene Cox, 1982. Hague, Richard. Crossings. Cincinnati, Ohio: Cincinnati Area Poetry Press, 1978.